Our local fave sushi place is owned by a great Sushi master chef and his wife. We aren’t into rolls etc, for us it is all about the raw fish quality and variety and they are amazingly consistent. Rather surprisingly in addition to being great with sushi the owner is also a master baker. Our daughter loves his Japanese style strawberry cake. It is light and not sweet - he lets the strawberries speak for themselves and the layers have lovely strawberry halves throughout (just as lovely as the ones on top). It’s become something of a tradition to order her a whole cake for her birthday and this year was no exception. This isn’t something they normally do so requests must be made well in advance. 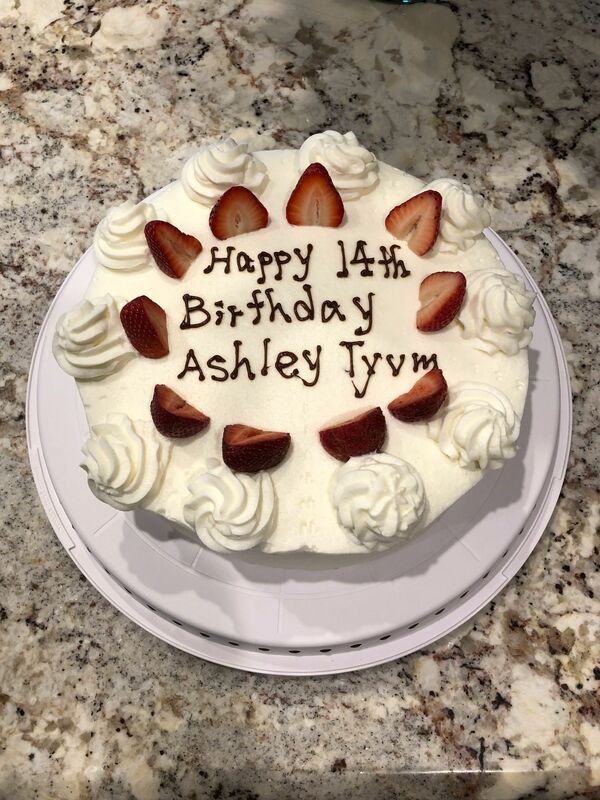 When my wife sent the text asking for the cake she included the message she wanted written on the top and ended it with tyvm (as in thank you very much). Apparently the distinction was lost as they included that on the cake as well as the message to the amusement of all concerned. N.B. he makes the best creme brûlée I’ve ever eaten.